A classic style trunk but we’ve simplified the design. Requires only one 4 x 8 sheet of plywood. The outer strips are made by resawing strips of 3/4” stock. Tray slides forward and back and lifts out. Measures approx. 19"H x 37"W x 21"D. The #6098 Steamer Trunk Special includes both #2714 Steamer Trunk Plan and #6092 Steamer Trunk Hardware package (sold separately). Steamer Trunk Hardware #6092 includes two hasps, lid supports, lock with two keys, a pair of hinges, a set of eight trunk corners, a set of four edge guards and a pair of handles with loops. 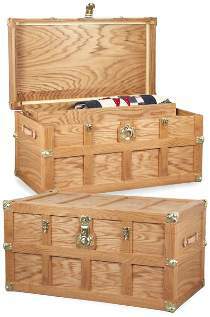 Special #6098 includes #W2714 Steamer Trunk Plan and #6092 Steamer Trunk Hardware to make one trunk.